In the not-so-distant past, guitarists learned that those great tape-echo units of the 1960s and ’70s not only added echo, but their preamps boosted signal, and in turn sweetened tone. 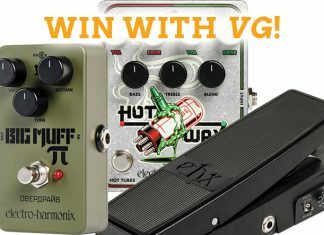 Soon, designers began isolating the preamp sections of echo units in simple 9-volt boxes. 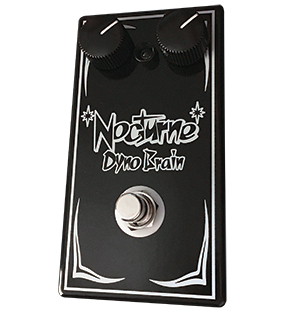 While this treatment has already been accomplished with the Echoplex, Nocturne has taken the same step with the preamp from the Roland RE-301 Space Echo and made it available in the simple two-knob (to adjust gain and bass cut) Dyno Brain. The Dyno Brain can run 9 or 12 volts, but Vega recommends the 9-volt setting for more saturation and less headroom. Its op-amp is socketed, which allows the player to try different chips to tailor their sound. The unit is also available in a BS-301 version that has a larger housing and utilizes a NOS Toshiba op-amp for those who want to follow the original design to the nth degree (and for a minimal $16 upcharge). In testing, the Dyno was fantastic for boosting at low to mid gain settings; it was also nice for pushing a non-master-volume amp into overdrive at extreme settings. It does add bass, hence the Bass Cut knob for situations where one’s sound can get tubby. The Dyno is different in that where most boosters are mid-focused and hairy, it’s much more even and clean. Though conceived for those chasing Brian Setzer’s tone, the Dyno Brain is great for those looking for a simple booster with a unique hi-fi tone.